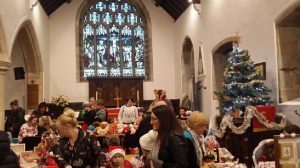 On Saturday morning, 1st December 10.00-12.00, the Church will host the joint Ysgol yr Esgob/St Michael’s Christmas Fair. 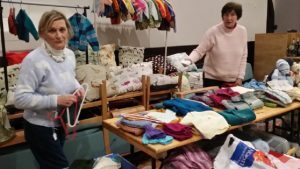 There will be many stalls, refreshments and Father Christmas. 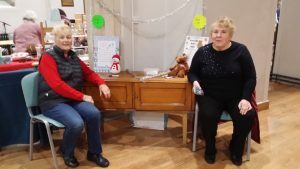 A good chance to buy some lovely presents! 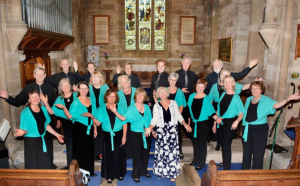 On Wednesday, 5th December, Cor Merched will perform its Christmas concert at 7.00 pm with Cor Meibion Caerwys. There will be a lively and varied programme– not to be missed. 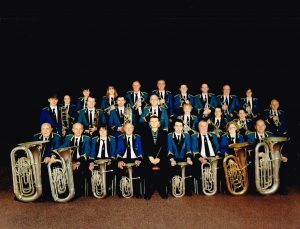 On Sunday 9th December at 3.00 pm we will bid a warm welcome to Holywell Silver Band. It will be an informal concert with a retiring collection– no entry fee tickets. Come and sing along to some favourite Christmas songs by the Christmas tree. On Friday, 21st December, at 7.00 pm we will dim the lights and begin our Christmas Carol Service. The church will be decorated for Christmas with flowers, holly, ivy and the large Christmas tree. Cor Merched, Caerwys and Cor Meibion Caerwys will lead our singing as we visit the Christmas story in carols and readings. After the service, which last about 55 minutes, we will enjoy mulled wine and mince pies. On Christmas Eve at 4.00 p.m. there will be a Crib Service in St Michael’s Church . It will be a service for families and children led by Ven Andy Grimwood. It will focus on the crib where the baby Jesus lay on Christmas Day. Children will bring figures of Mary, Joseph, Jesus, the shepherds, and the Three Kings to the crib as a way of dramatizing the Christmas story. There will be Christmas Holy Communion on the night of 24th December at 9.30 pm. This will be a Holy Communion Service with carols, readings and prayers. 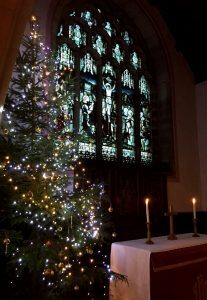 Our Christmas Day Service will be Holy Communion at 10.30 a.m.
At none of our services do you need to wear your ‘Sunday best.’ Come as you are, and enjoy this opportunity to sing, reflect and look forward together. 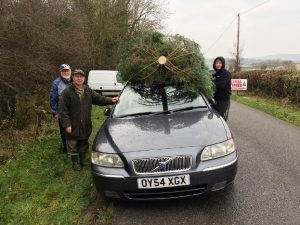 Our photo shows Bob Garside and Daniel Thomas collecting a magnificent 20’ Christmas tree for the church from Alan Hughes of Pen y Cefn. 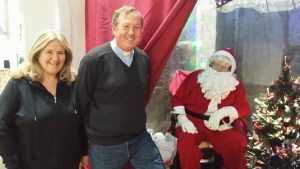 David and Alan Hughes have donated a tree to the church each year for many years, continuing a tradition started by their father. We are very grateful. Should you be interested in purchasing a fresh Christmas tree at very reasonable cost, their number is 07747345343. 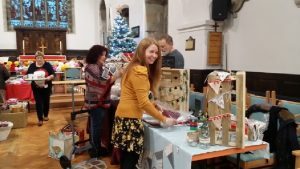 The tree will be set up and decorated under the direction of Mrs Nerys Thomas in time for the church Christmas Fair on 1st December 10.00-12.00. The view from the ground and the air. There are few who know more about the inscriptions on the memorial stones in St Michael’s Church, Caerwys, than Janette Fenney. 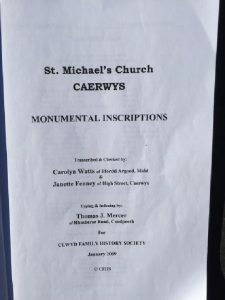 Janette was a volunteer recorder for the Clwyd Family History Society’s project to record and index the inscriptions in the churchyard. The research started in 2004, and the index was published in 2009. 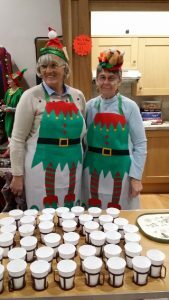 Janette worked under the guidance of Carolyn Watts, who did much to enthuse and train volunteers in parishes in North East Wales. Janette remembers her time as a volunteer very clearly. She came to the churchyard to record the inscriptions whenever she could. She spent five years as a volunteer on the work. Recording was not always straightforward. Many of the older inscriptions were in antique script, which was sometimes hard to decipher. Use of abbreviations was common. Some inscriptions had been partly worn away or cracked. Many were Welsh language inscriptions. One of Janette’s best friends, Hilda Powell, died during the period of the research. 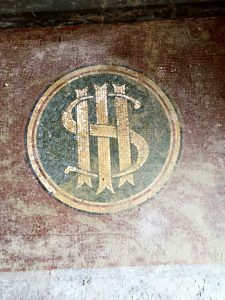 Janette made sure that Hilda’s inscription was included before the record went to press. The outcome of the project was an invaluable index of the inscriptions on all the visible memorial stones in the churchyard. If you are looking for the grave of a relative you can check the surname index, and if it is recorded, you get a word-for word description of the inscription. You also get an index number which gives you the location of the stone on a plan of the churchyard. It is a unique resource, which has helped people from near and far trace the resting-place of their ancestors. 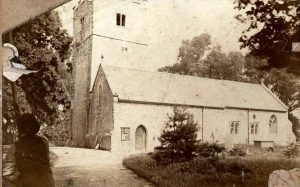 A copy is kept in the vestry of the church, and can be accessed by contacting Roland Ward (warden1@stmichaels-caerwys.org.uk), or it can be purchased via the Clwyd Family History Society website, www.clwydfhs.org.uk. Detailed though it is, the publication can’t be a complete record of burials. Many graves were marked with wooden crosses or plinths, which have disappeared with the passage of time. Some burials were in unmarked graves. The turf of the churchyard has covered many memorials. Having said that, it is a priceless resource for family researchers and for local historians. What do memorial stones tell us? They tell us about extended families and the life spans of their members in the days before antibiotics and anaesthetics. They reveal the staggeringly high rate of infant mortality before the 1950’s.. Each stone has a story to tell. Among the oldest stones are the memorial stones that the Victorians rescued from the churchyard and erected in the western corner of the north nave. The Gwyean Fach stone dates from the 1300’s. There is also a slab in two pieces on which the remnants of a very fine and very ancient cross head are carved. If you were buried in a grave with a carved memorial stone before the late 1700’s, you were almost certainly from a wealthy family. By the 1800’s stone or slate memorial stones were the norm. Often several generations are commemorated on one stone. Towards the end of her time as a volunteer, Janette found a stone memorial almost covered with turf. Carefully, she lifted the turf, and recorded the inscription. She realised that the stone was part of a pathway, but she was not allowed to pull the turf back to reveal it. It was that pathway that Brian and Tricia Vaughan uncovered 13 years later, a photograph of which appeared in the last issue. There is no plan to expose more gravestones hidden under the turf. They are best left. Enough has been revealed, however, to show what a rich heritage we have there, which we must conserve and respect. 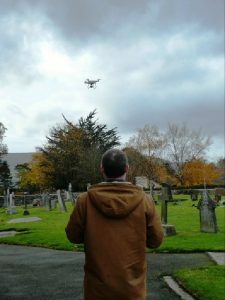 In the last week Zac Savva has brought his commercial drone to the churchyard to take some trial aerial photographs. The definition and contrast are excellent, and the photographs will help us to identify any more pathways hidden under turf. A video prepared by Zac is now on the church website under ‘Views of the Church’, www.stmichaels-caerwys.org.uk. Can you put a date to the old photo of the west side of the St Michael’s Church churchyard shown below? There was no church clock (1913) The church entrance was where the vestry is now. There was no west porch. Both the porch and the vestry were built in 1904. There is a glimpse on the right of the building of the large buttresses that held up the east wall of the church before the renovation in 1896. The photograph has to have been taken before 1896, and my guess is that it is from the 1880’s. The churchyard then was very different to what it is now. The grass was long. It was probably scythed twice a year, and perhaps sheep were left to graze there at times. The churchyard accommodated a number of large trees and bushes. There are some prominent headstones and family monuments with railings around them. Most memorials are below the long grass, however, and there are some headstones resting against the west wall, having previously fallen down. It was a far cry from the mown and manicured churchyard that it is now. In Caerwys, the memorial stones that survive from before the 1900’s are in slate, stone or marble. The larger stones were designed to stand upright. There is often as much of the stone below the surface as appears above, and they are very secure, even if they do lean with the movement of soil over time. The smaller stones were designed either to go on a plinth or to lie flat. Over time, the church has laid insecure stones down, and has formed pathways and borders in the churchyard from laid memorial stones. In modern times, memorials are fixed upright on cement foundations, and the grass around them is mowed regularly. They will remain visible and cared for, hopefully for generations. Visitors often comment on how well relatives look after the graves. The turf of the churchyard has covered many older memorials. The churchyard turf very slowly but inexorably grows across stones which are laid flat. Many have disappeared below a carpet of turf. It’s a natural process of reclamation as time passes and as memories fade. 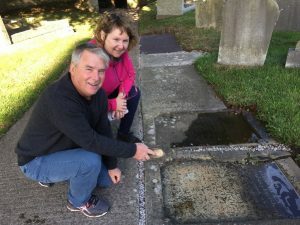 In 2018 two Wardens of St Michael’s Church, Brian and Tricia Vaughan, and Peter Dooley, Deputy Town Mayor have been restoring parts of the churchyard and have revealed memorial stones previously lost under turf or ivy. 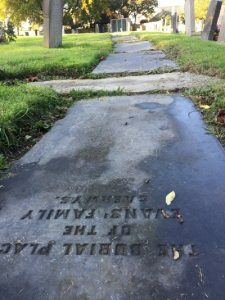 Earlier this year, Brian and Tricia were weeding around memorial stones in the eastern part of the churchyard, when they came across what looked as if it could be a pathway of stones from the late 18th and early 19th centuries. The stones were covered in turf. Carefully, they lifted the turf, removed it, and cleaned the stones. They are there for all to see, and include some of the earliest surviving stone memorials in that part of the churchyard, dating from the 1700’s. At the same time, Peter Dooley has been working hard in the churchyard to reveal and clean memorial stones which have been on the point of encroachment by the turf. They are by the main path. Where the stones have split or sunk, Peter has raised them and re-set them, so that they are real features of interest as you walk through the churchyard. 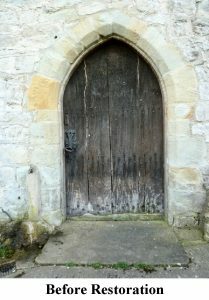 Peter has also refurbished the doors of the lychgates and repaired worn concrete paths. Where are the earliest stones? The earliest memorial stones are not in the churchyard at all. Any guesses? More information in the next issue of the Caerwys Chronicle. We know a lot about the memorial stones because of the work that the volunteers of the Clwyd Family History Society did from 2001 to record the inscriptions. Their story will be told in the next edition of the Caerwys Chronicle. Brian, Tricia and Peter are carrying on with their work in the churchyard. With the help of Rob Kendrick, contractor, and church members they have cleared an area on the north side of the churchyard hidden behind large bushes of laurel and holly. They have removed ivy from the churchyard walls. On the far side of the eastern edge of the churchyard, Tim Biddle has tended the natural meadow. He has planted wildflower seeds and plugs and has made sure that the meadow has been mown at the right times. It will blossom as a wildflower meadow in the spring. Ven John Lomas, Rector, commented in the Harvest Service that, ‘the churchyard has never looked better’. Visitors say that it is a churchyard that is cherished, by relatives, by the church congregation, and by the people of Caerwys. It reflects a community that cares. It was a packed church on Sunday 14th October for John Lomas’s final scheduled service as Rector of Caerwys. John spoke movingly of what his four years in Caerwys had meant to him and his family, and the congregation turned at the end of the service to applaud him. It was an emotionally charged service because John has been special to many people. His ability to put everyone at ease, his humour, his kindness have meant a great deal to those who have come to church routinely, or for funerals, baptisms or weddings. John is also an inspiring preacher, who has the gift of making you look afresh at your beliefs and at scripture. Quite what a vising delegation from the diocese of Helsinki, Finland made of the service, we are not sure, but they seemed very impressed! After the service church members and friends from Capel Bethel met for a very good afternoon tea at the Golf Club, where there were presentations and speeches. Brian Lord drew his inspiration from Ken Dodd for a tribute which did a great job of lifting the mood. Nerys presented Jan Lomas with flowers and thanked her for all her kindness and friendship. 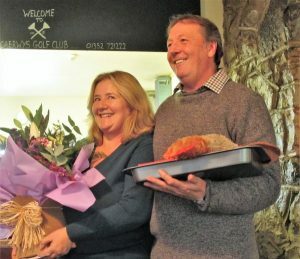 She and Roland presented John with his gift from the church, and a stuffed toy chicken called Percy, the symbolism of which is too complex to explain here. We shall miss them, as will many in Caerwys. However, there is to be no ‘interregnum’. 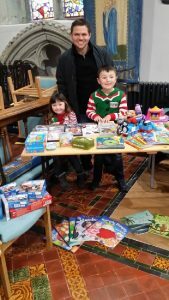 Ven Andy Grimwood, the new Archdeacon of St Asaph, was in church to lead next week’s Sunday service, and it was clear that he and his family will be drawn in to Caerwys life as everyone else is. Andy is going to be a great asset, and we look forward to working with him. At the end of September Ven John Lomas, Archdeacon of St Asaph, who has been based in Caerwys since 2014, will move to be Archdeacon of Wrexham. The new Archdeacon of St Asaph will be Ven Andy Grimwood, who is currently Vicar of Rhyl. 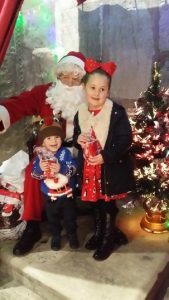 Andy and his family will move into the Rectory in Lon yr Ysgol in late October. Andy will be one of the ministry team in the Denbigh Mission Area. and will be the point of contact for any queries from residents of Caerwys. He will lead services in St Michael’s Church when his duties across the Archdeaconry of St Asaph allow. 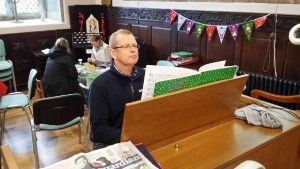 A profile of Ven Andy Grimwood will be submitted for publication in a later edition of the Caerwys Chronicle, along with contact details. Thanks to Peter Dooley for doing a great job refurbishing the lychgates and clearing verges in the churchyard. Peter has volunteered hours of work for this, and it has made a huge difference. £5 on the door: light refreshments. During Lent there will be services every Wednesday afternoon at 4.00 pm. Most will be lay-led, based on a Church Lent Service approved by Ven John Lomas. The services will be short– no longer than 30 minutes, and will include readings, responses and prayer. The first service will be on Wednesday 21st February , and will be led by Elizabeth Lord. 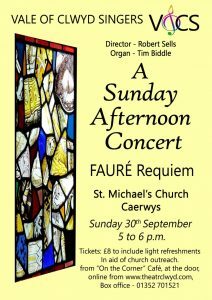 It’s the first of our one-hour Sunday afternoon concerts. Who better to start the series than the Robbie Savva Ukulele Band? They are a local band with an impressive line up and repertoire. In the new acoustic of St Michael’s Church, they’ll sound fantastic.. Come and hear them, and sing along with them. Refreshments (coffee, tea or glass of wine), during the break. £5 on the door– no tickets. Concerts of just one hour on a Sunday afternoon followed by a glass of wine or cup of tea. A varied programme. Very reasonable entry charges. That’s the formula for the forthcoming series of Sunday afternoon concerts at St Michael’s Church. They will take place roughly every six weeks. Why are we doing it? Simply because we’ve got a beautiful, warm church building now, and we want to see it used more. Why not open it on Sunday afternoon for some great live music? 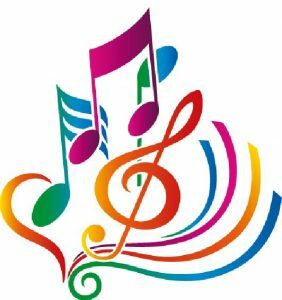 There will be a concert by the renowned Chester Brass Band on 29th April at 4.00 pm and by the Vale Royal Singers on 10th June at 4.00 pm . Who better to start the series, however, than the Robbie Savva Ukulele Band? They are a local band with an impressive line up and repertoire. Come and hear them, and sing along with them. That’s on 4th March at 3.00 pm. It’s an early start time because it won’t yet be British Summer Time. 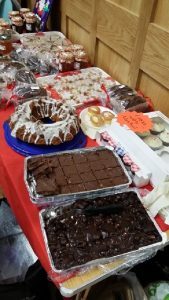 No tickets– pay on the door £5. 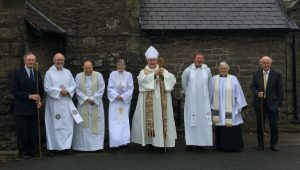 On a rainy Sunday, we were there to welcome Canon John Evans, Ven Chris Potter, Rev’d Sue Moriarty and Rev’d Vera Lewis to the re-dedication service, which was led by Bishop Gregory and Ven John Lomas. The service brought together almost everyone who had had a hand in the renovation project. 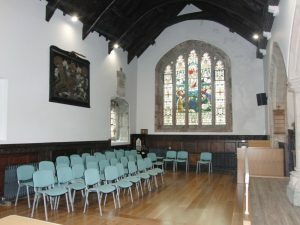 Among the congregation was the Project Architect, Robin Wolley, the contractor, Gareth Williams, and members of the church who had worked on it– the Buildings Committee (Bob Garside, John Harris, Vicky Jones, David Knights), and the support team (Peter Dooley, Sheila Garside, Sylvia Harris, Eileen Knights, Nerys Thomas). It was good that Neil Parry, son of the late Francis Parry was there. Francis had been invaluable as a member of the Buildings Committee, with his practical knowledge as a skilled joiner and clerk of works. It was also good that Mrs Sue Clisham, Head of Ysgol yr Esgob attended along with Town Councillors and members of the Caerwys community. Pupils from Ysgol yr Egob have been involved in various ways in the project. Ven John Lomas, who had spent hours up ladders fixing audio leads, as well as supporting us in meetings, introduced the service. The Singing Group sang the Psalm to Brother James’s Air– a beautiful rendition, and Joseph Jones and Tegid Leggett-Jones sang superb solos. Among the congregation were the many who had donated, all anonymously, to the project. Without their contributions, the project would have had to be phased, and would still be in progress. 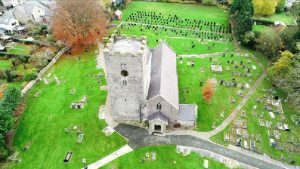 The ITN Wales feature was notable for the precision use of a drone to deliver stunning footage of the church from high up in the rafters. 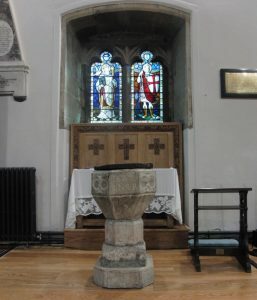 It provided a unique insight into the tiling in the renovated chancel – and it looked even more beautiful than it appears at ground level. Since then, there have been many visitors to the church. The time spent on preparing the website and the leaflets for visitors, which pupils of Ysgol yr Esgob had a hand in, was amply justified. The leaflets have been in much demand. It was, for all, a moving moment when Bishop Gregory came forward to pronounce the re-dedication blessing. The changes brought about in the renovation project were now confirmed. Time to move on and to use the new facilities to the full. 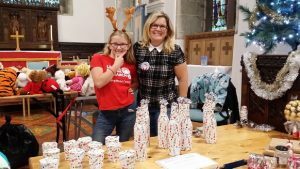 The Christmas Fair 2017 in St Michael’s Church raised £845 between Ysgol yr Esgob PTA and the church. Just on opening time there was a short hail storm followed by torrential rain. Even so the fair proved as popular as ever. 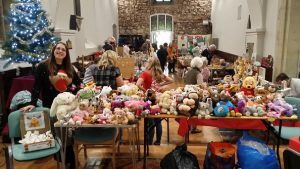 It was a busy Open Afternoon on 14th October as large numbers of Caerwys residents visited St Michael’s Church to view the renovated church. People took their time looking round and enjoying some refreshments. 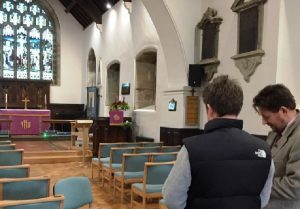 The next day there was a full congregation for the opening service followed by a celebratory glass of bubbly. On 19th October, Ysgol yr Esgob gave a splendid harvest festival. All pupils took part, and it was great to see them make use of the new open chancel area to the full. The church will be open every day now. It’s there for anyone who wants to go in and sit in the quiet, or light a candle. You can take one of the new guide leaflets and explore the historical features. On the afternoon of 5th November the Civic Service will be held in the church, and on 10th December at 11.00 a.m. Bishop Gregory, Bishop of St Asaph, will lead a service of re-dedication. Former Rectors and many old friends will join us for that service. Friday 22nd December 7.00 p.m. Carols and Readings Service. 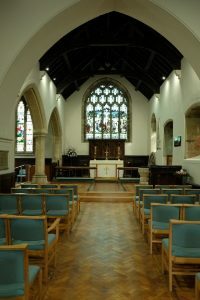 The photographs show some of the interior of the newly renovated Church with the pews replaced by comfortable chairs, the font re-sited and the wonderful tiles that have been revealed by the altar. 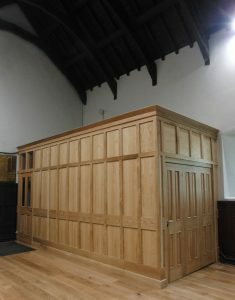 Hidden behind the beautiful oak panelling, where the old organ was sited, is a small kitchen area and an accessible toilet. I think everyone who has seen it will agree that the church looks wonderful and is a warm and inviting place in which to worship. 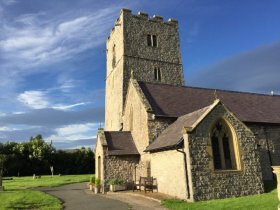 On the afternoon of 14th October, the congregation of St Michael’s Church will host ‘open house’ for Caerwys people to see the renovated church. Drop in for a cup of tea or coffee any time between 2.00 pm and 4,00 pm on that Saturday afternoon. 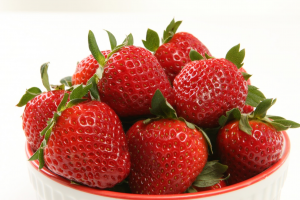 We will return to the church with a Holy Communion and Harvest-themed service at 11.00 a.m. on 15th October. The service will be led by our Rector, Venerable John Lomas, Archdeacon of St Asaph. It will be a time for celebration and thanks. Do join us. There will be a formal service of dedication of the renovations in November. The repairs to the plasterwork, the windows, the flooring and the roof will maintain the integrity of this ancient building for a generation. We have also taken the opportunity to adapt the church for 21st century worship and community use. As a result of this project, the church will be warmer, people will sit in more comfort, they will be able to hear better, and to see what is going on more clearly. There is now a new toilet and a kitchen area. No more searching for the Portaloo in the churchyard, or going out to the tap outside for water to fill the kettle. 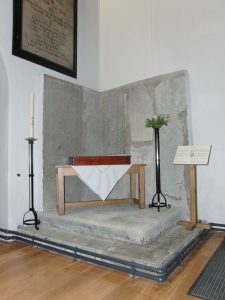 The chancel is now an open area, and the low wooden screen that was placed there in 1905 has been relocated along the North wall. In the chancel the Rector will lead services, choirs will sing, and nativity plays will be performed, all in clear sight of those seated in both naves. The old wooden floors have been sanded and sealed, and the lighting has been vastly improved. The aim of this has been to highlight the memorials, the windows, the altar and the carvings which make the church such a beautiful heritage site. The carpet has been removed to reveal beautiful Victorian tiling, which has been carefully restored. 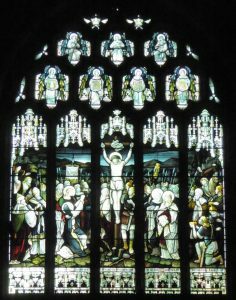 The Heritage Lottery Fund, The National Churches Trust, The Garfield Weston Foundation, The James Pantyfedwen Foundation, The Maude Yeardye Trust, and The Allchurches Trust. We have counted our blessings throughout the project. 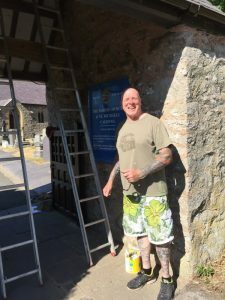 The work has been undertaken by Gareth Williams Joinery, a local firm who specialise in work in ancient churches. Their tradespeople and their sub-contractors have proved skilful, and sensitive to the need to get the detail right. They have gone out their way to restore the church sympathetically. Robin Wolley, the Project Architect is amongst the most experienced and talented conservation architects. He has overseen it with care and imagination. 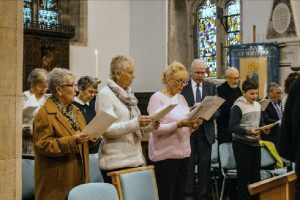 Throughout the Building Committee of the church, and individual members of the congregation have been supportive, and our Rector, John Lomas has given unstinting support and help. We have made no structural changes. St Michael’s Church has never been the victim of wealthy people’s vanity projects. Each generation has made its mark, and has adapted the church to its needs. What you see now is the outcome of centuries of piecemeal change, and that it what makes it such an important heritage site. 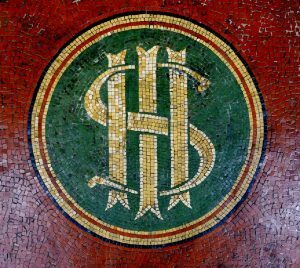 If ‘heritage’ and ‘tradition’ meant ‘no change’ there would still be rushes on the floor, there would be box pews rented by the wealthy for their privileged use, and standing room for the rest. For the church to survive as a heritage building it has to be used. Our challenge now is to use it to the full, to the glory of God, and in service of its community. 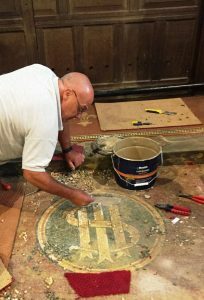 The Heritage Lottery Grant has funded two outstanding pieces of restoration in St Michael’s Church. The north door, which carries the inscription 1760, was rotting from the base. Over the centuries rainwater has run down the door and accumulated in the sill near the ground. The rot had spread upwards through the joints. 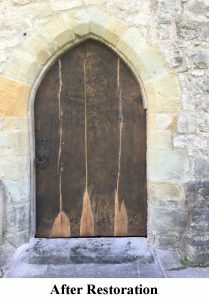 Contractor Gareth Williams of Bagillt and architect Robin Wolley have restored the door so that it will be good for another 300 years. Gareth has replaced the rotted wood with oak, carefully interleaved into the door joints. He has removed the sill and raised the stone threshold of the door, so that there is not a gap at its base, and so that rainwater will run off down to the path. The new wood will not be painted or stained. It will be left to weather so that it matches the original timber. The inscription on the door remains, and so does the alleged bullet hole, carefully plugged, which featured in a recent story in the Chronicle by Brian Lord. Inside the church, Gareth Williams and his team revealed some exceptional examples of Victorian tiling in the chancel area. The tiles had been covered by carpet and a considerable thickness of adhesive. When they lifted the carpet, the tiles came with it. It took a great deal of patience and care to restore the original design. It was worth the effort. The colours and the motifs are impressive. The photos show Gareth Williams replacing the mosaic tiles, and a section of the finished floor prior to cleaning and polishing. Work continues on the restoration of the stonework of the windows on the South wall, and the plasterwork in the nave and chancel has been comprehensively repaired, using many coats of lime plaster. The screening for the new toilet and kitchen is now in place, and the heating is being upgraded. The church will be in use for a wedding on 30th September, and will be officially opened in mid-October.